From the popular Blizzard Entertainment shooter, Overwatch, comes this Genji FiGPiN hard enamel pin! Genji is amazingly detailed and is able to stand up with the signature FiGPiN rubber backer stand. The 3-inch tall pin comes displayed in front of a collectible Overwatch art backer card and is fully capsulated in the ultra collectible FiGPiN clear protector case with a special variant white plastic base. 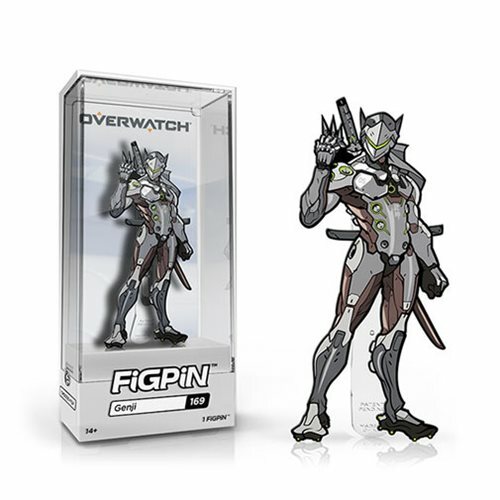 This Overwatch Genji FiGPiN Enamel Pin is #169 in the collection. Ages 14 and up.